We'd love to meet you! Please stop by our store and we will be happy to show you around our 6,500 square foot showroom. We are easy to find on the west side of Houston and we always have plenty of parking. Stop in and let us show you around our 6,500 square foot showroom filled with an eclectic mix of gently used, consignment, and new furniture, plus an interesting assortment of artwork and home decor items. Our friendly staff is happy to help you find just what you are looking for. Trouble finding that just-right item? Then register in our Wish Book and we will let you know when your dream piece arrives. 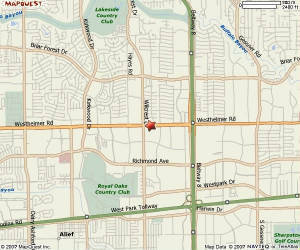 Our showroom is located at 11026 Westheimer in the Westchase District, on the corner of Westheimer and Wilcrest. We're behind Walgreen's in the Lakeside Village Shopping Center. Always plenty of parking.